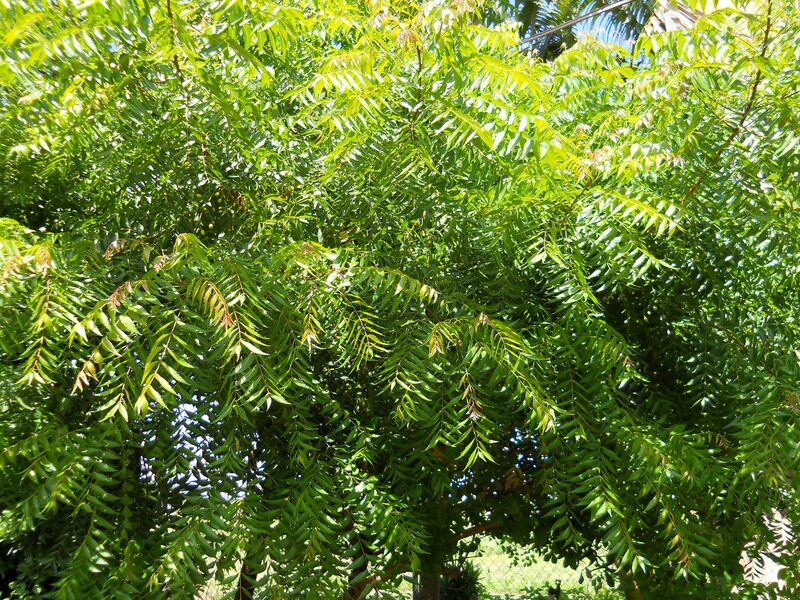 Neem Tree (Azadirachta indica) - Richard Lyons Nursery, Inc. Does the name ‘azadirachtan’ ring a bell? It probably should, because it is a hugely versatile chemical compound that has made the neem tree legendary in India and surrounding lands for some 2,000 years. And chances are that its full medicinal and insecticidal potential has yet to be tapped. 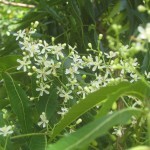 The neem tree (Azadirachta indica), a relative of mahogany and Chinaberry, has a lot going for it. It is a very attractive, fast-growing, long-lived ornamental plant which — in decent soils — matures in the 50-65 ft. range. In southern Florida, the tree rarely reaches 30 ft. It has a rather dense, rounded crown capable over time of growing almost as broad as the tree is tall. It bears fragrant white flowers in a somewhat drooping, compound inflorescence; in fact, there may be as many as 250 flowers in a single inflorescence! This species is also quite drought-tolerant and amenable to a variety of soils. Despite its rapid growth rate, neem trees produce construction-grade timber, thanks to chemical properties that make it resistant to termites. The fruit of A. indica is, like that of peaches and plums, a drupe, or stonefruit. It may vary in shape from nearly round to elongate, and in size from ½-1 in. 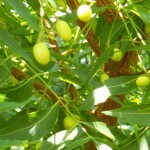 However, the neem pulp is very fibrous and bitter-sweet. What this species lacks in fruit value it makes up for in its chemical properties, particu- larly neem oil. 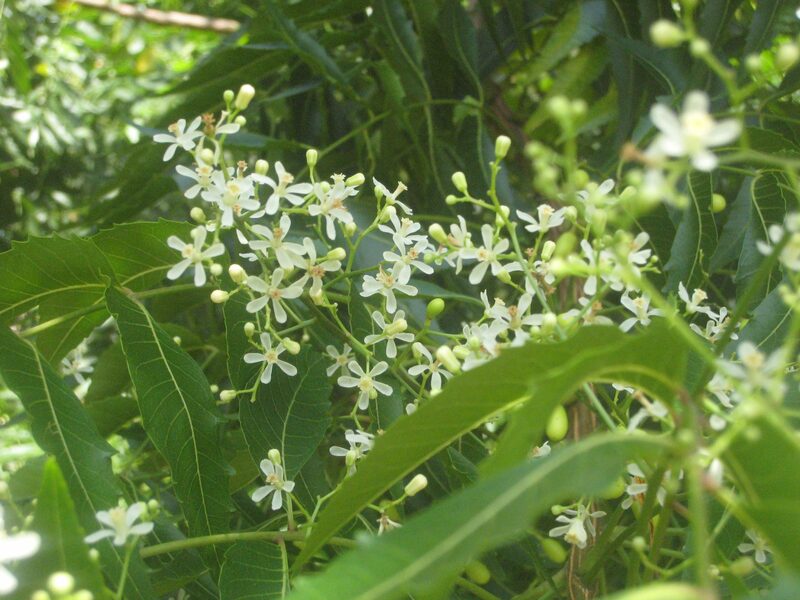 Azadirachtan, the best-known constituent of neem oil, is concentrated in the seeds of this remarkable tree. Neem oil can be burned in lamps, used as a spermicide, and employed in the manufacture of toothpaste, soap and skin care products. And after the oil is extracted from the seeds, the residue, called neem cake, is both fed to livestock and used as a fertilizer. 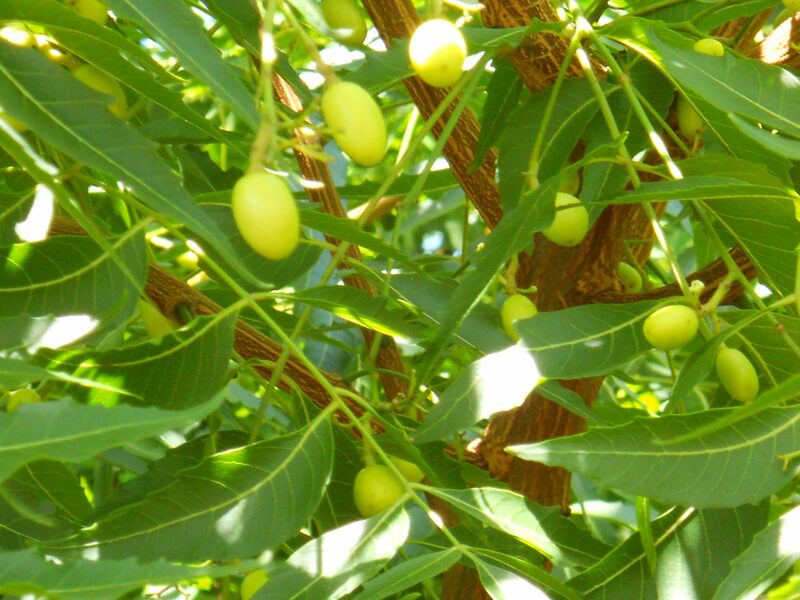 But neem’s past applications and future potential are probably most widely known in the realm of its potency as an insecticide; by some accounts, neem oil is effective against some 200 insect species. It does not work as an instant knock-down killer, though. Instead, it causes hormonal disruption that leads to the eventual collapse of populations of chewing and sucking insects. And the mere presence of neem oil — without actual contact — is reputed to repel certain insects, not the least of which is mosquitoes. The oil has some efficacy when mixed with coconut oil and applied to the skin, as well as when burned in a lamp or candle. 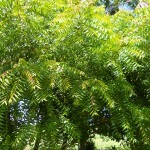 The neem tree is available at Richard Lyons’ Nursery in 1-gal. and 3-gal. containers.